during hydrographic surveys were routinely sent to the Smithsonian Institution National Museum of Natural History (NMNH) for curation. USCGS and NOAA/NOS hydrographic party personnel also generated forms documenting and describing these samples. Both the samples and forms were sent to the Smithsonian. Smithsonian staff then key-entered information from the forms into the NMNH Paleobiology Sediment Collection database. NOAA discontinued the practice of sending samples to NMNH in September of 2001. Also in 2001, NMNH gave NOAA's National Geophysical Data Center (NGDC) a copy of information from their database documenting USCGS and NOAA/NOS samples in their collections. This was a one-time transfer to make the collection searchable via the Index to Marine and Lacustrine Geological Samples (IMLGS) database. No further contributions to the IMLGS are expected from NMNH. cite as: Smithsonian National Museum of Natural History (NMNH)(2001): Archive of information about geosamples curated by NMNH collected during NOAA/NOS and USCGS hydrographic surveys. NOAA National Centers for Environmental Information. doi:10.7289/V5J38QHJ [date of access]. 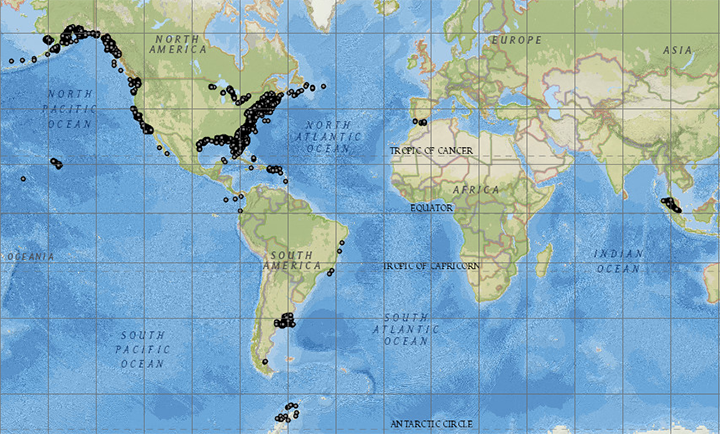 Open an ArcGIS interactive map interface with the NMNH sample layer active, to search and download data from the IMLGS database and access related links. Text interface to search and download data for NOAA/NOS and USCGS samples curated by NMNH from the IMLGS database and access related links. How to cite this data set (doi:10.7289/V5J38QHJ), all access options, and complete documentation. PDF document containing historic NOS bottom type characteristics codes used in older, hand coded descriptions. Data Update Frequency Irregular - This dataset was a one-time contribution by NMNH to the IMLGS. The data in the IMLGS pertain only to geological samples sent to the NMNH for storage. This dataset is not to be confused with the NOS Seabed Sample database of information describing all samples collected during hydrographic surveys -- that larger database is described elsewhere and has a map service. Sample data include survey id, sample number, latitude/longitude, original datum, sample description, and other locational and collection information, including NMNH catalog number. Purpose The purpose of adding information about USCGS and NOAA/NOS samples in the NMNH collection to the IMLGS was to facilitate discovery via IMLGS web interfaces. USCGS and NOAA/NOS hydrographic survey personnel collected and described the samples. The Smithsonian Institution National Museum of Natural History (NMNH) staff coded information into the NMNH Paleobiology Sediment Collection database. Samples in the NMNH Sediment Collection may not be available for study. Other Constraints cite as: Smithsonian National Museum of Natural History (NMNH)(2001): Archive of information about geosamples curated by NMNH collected during NOAA/NOS and USCGS hydrographic surveys. NOAA National Centers for Environmental Information. doi:10.7289/V5J38QHJ [date of access]. Lineage Statement Geological samples and accompanying information were sent to the Smithsonian for curation.